The last time we posted about Primal Carnage was in 2010. At the time, all we got to see was a collection of animation demos created by independent development team Lukewarm Media. Their ill-advised experiments with prehistoric DNA have come a long way: Lukewarm has since found a publisher, and its multiplayer dinos vs. humans eat-em-up is almost ready for its beta test. 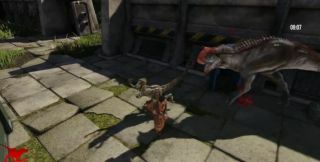 The latest character showcase trailer shows off the Raptor and Trapper classes. One has little arms, screams a lot, and tears flesh with its vicious razor teeth, and the other has nets. The game's official site contains information on the other classes and game modes, as well as a beta signup form.